The Akhilesh Yadav government made Ayodhya almost a fort with 8000 cops and also got hundreds of preventive arrests since yesterday to ensure that the VHP was unable to set off on a 300-km march through six districts to circle Ayodhya.The six UP districts that the VHP yatra would have traveled through have a decent Muslim population. The VHP, a wing of RSS demanding Ram Temple in the disputed area of Ayodhya has declared revival of the yatra from the coming month to gain support for the same. Praveen Togadia , the leader of VHP has been taken into preventive custody while anothe VHP leader , Ashok Singhal, has been detained at the Lucknow Airport. 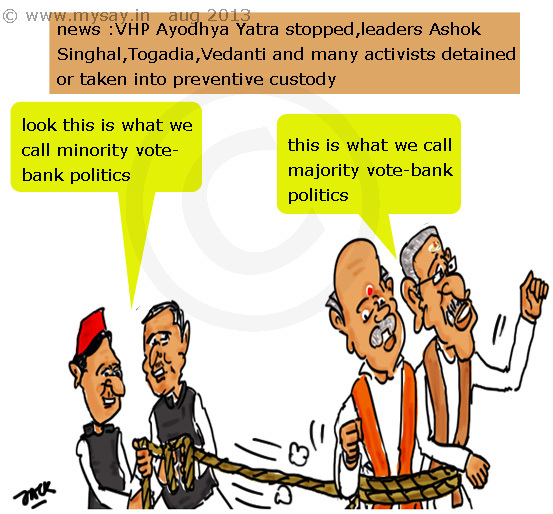 This unsuccessful Yatra ,seem to have served its purpose- the Govt of UP showed how concerned it is about the security of Muslims ( a major source of its vote bank) and the VHP rekindling the Ram Temple issue may have revived BJP’s place in the minds of those few hardline Hindu voters who wish to see Ram Temple in the disputed area of Ayodhya. Isn’t this dual politics in the name of faiths ?